New Listing! Treetop Cabin with a HUGE deck to enjoy the AMAZING Views. Enjoy a cup of tea as the sun comes up or glass on wine as it sets on the expansive deck overlooking the San Jacinto Mountains. Unlike sterile rentals this newly remodeled 2 bedroom 1 bathroom cabin is truly our family’s mountain getaway. We have had such a spectacular experience escaping the city and rediscovering our love of nature, we want to share that experience with others! This cabin is well equipped with all the essentials for a great weekend in nature. Take your dog on a hike and appreciate the wind in the trees, share some laughs with the kiddos while playing one of the many games for kids and adults, gather together with friends over the fondue pot and experience real quality time with loved ones. This cabin is best suited for a family of 4 or 5 or two (carpooling) couples as there is a flat convenient parking space for one car only. For guests, there is ample street parking at the end of the street, a quick 5 minute walk to the cabin. You furry friends are welcome (with an $40 cleaning fee). The upstairs bedroom is spacious with a king size bed and flatscreen monitor. There is large selection of DVDs for kids and adults (or rent one in town) as well high-speed internet with a Netflix account for your enjoyment. The upstairs bedroom is not ideal for small children as they could possibly squirm their way between the bars in the railing. The downstairs bedroom has a queen size bed as well as a twin bed and spacious closet. The twin folds up against the wall for guests that don’t need the extra bed. The full bathroom has a tub perfect for the kid’s bath or a long soak after a strenuous bike ride. The bathroom has an on-demand wall heater to keep the chill away on the coldest of nights. The kitchen is entirely new with modern appliances and stocked cupboards. All the necessities for baking are included and condiments galore. The dining area seats 6 and the warm living area has a comfortable couch as well as a rocker loveseat that is heavenly when pulled up in front of the fireplace. Step through the large sliding doors onto the HUGE deck and appreciate the expansive view from the treetops. 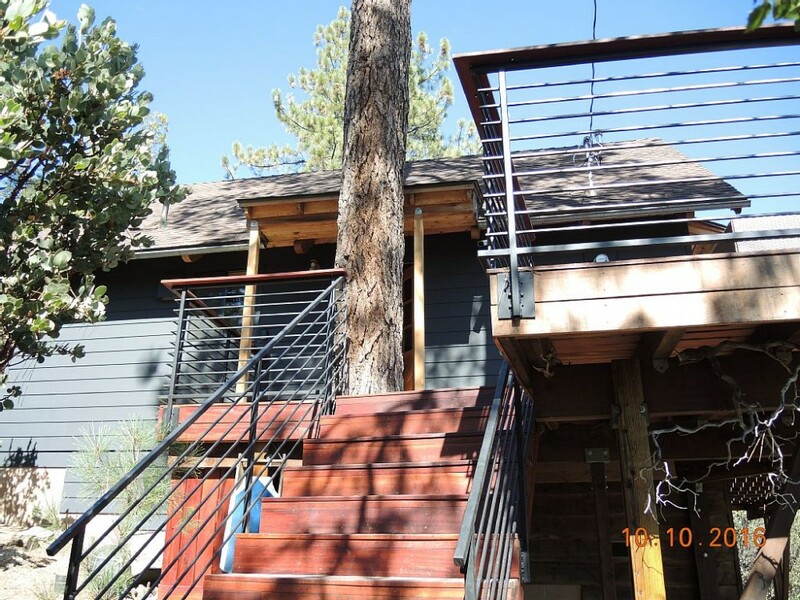 There are birds galore as well as acrobatic squirrels in the massive Jeffrey Pine that passes up through the deck. This peaceful neighborhood gives the gift of being able to look out over the swaying trees or up towards the breathtaking stars and revel in the quiet. Those seeking more activities can find some great shops in the quaint (and incredibly dog-friendly) Idyllwild village, a short 3.5 miles drive. We can’t say enough about this little town that we love…take your bikes (or rent them at the Hub Cyclery) and enjoy the trails, have a glass of wine and listen to some terrific music at Idyology while the kids play by the river, stop by the ice cream shop, enjoy incredible Italian food at Fratello’s or brunch at Café Aroma. We have a wilderness pass for your use during your stay as well as a selection of toys (legos, kites, sleds, a kid’s swing, and much more) that we are happy to share with you. We’ll gladly answer any questions about the cabin rental and help you plan your perfect mountain getaway. Wonderful cabin, well equipped with attention given to pretty much anything you would need during your stay. The deck and amazing views are the icing on the cake. We spent a few nights at this wonderful house. We had 2 kids with us that enjoyed their time exploring the house and toy closet. Thank you for a wonderful hospitality. We definitely recommend it to everyone. Peaceful getaway for my family! My wife and I took our 1 year old out of town for a long overdue family getaway. We absolutely loved the cabin! The patio is very large with incredible views and plenty of space to BBQ, read and just relax. The A-frame cabin is newly furnished and my son slept like a baby in the back room while we got some rest on the new cal king in the loft. The owners did great stocking the kitchen and bathroom with all the basics. The bedding and furniture were perfect. They were very friendly and made sure we enjoyed our stay. We plan to visit here again!